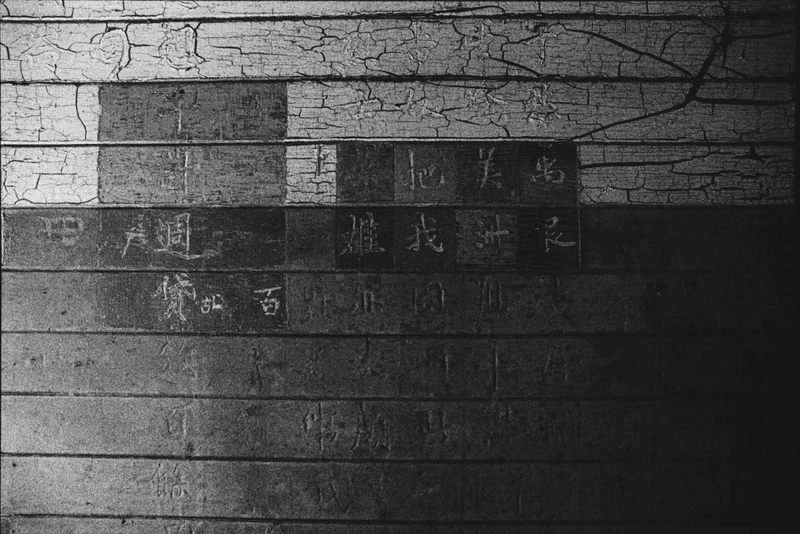 This photograph shows a segment of a Chinese poem carved into a dormitory wall. Unlike their counterparts at Ellis Island who were usually granted entry to the United States after several hours, immigrants processed through Angel Island waited weeks, months, and sometimes years to enter the US. Most of that time waiting was spent in the dormitories where Chinese immigrants carved poetry into the walls. These poems communicate the sadness, loneliness, frustration, and hope detainees felt as they waited to enter the United States and begin their new lives. Berndt, Jerry, “Poems of dispair carved into the walls of dormitory room, Angel Island Interment Camp, Angel Island, San Francisco, California, 2003,” Digital Public Library of America, https://dp.la/item/8a34097426ba35a0ae94e42557307e65.